The standout element of August’s eye candy is the range of textures; an infinity of brushstrokes lies between these 13 images. Rich Tommaso’s Spy Seal is so very, very European, with a “ligne claire,” or clean line, to flesh its anthropomorphic fauna in bold, bright precision. It looks like a relic from another era that would be sold on Amazon in unwieldy dimensions for the price of a five-star meal, which is a rarity in today’s aesthetic market. Ray Fawkes gets messy in Underwinter #6, placing circular blotches of ink alongside tighter figures, with gentle washes of indigo watercolor tiding beneath. The approach offers a cool juxtaposition of the book’s themes—the mathematical, left-brained precision of classical musicians clashing against occult, lawless chaos; form is function, and if an image could make a sound, this one would ring out in alarming dissonance with the sharps and flats tangled into oblivion. 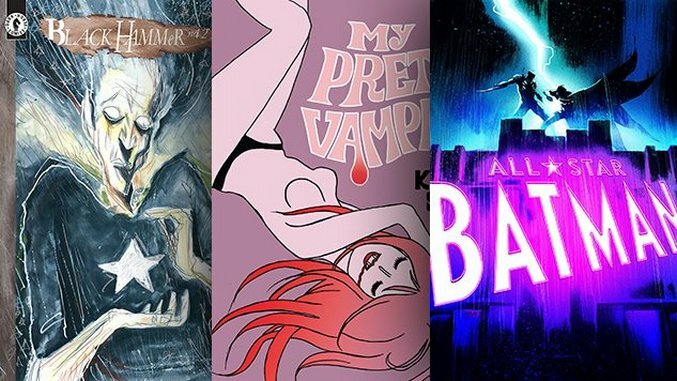 On the note of both European art and horror, Katie Skelly returns with the new graphic novel My Pretty Vampire, which feels like a psychedelic Warhol spinoff from the ‘60s. Skelly maintains a tight design while lending an organic texture to her lines, forming an image at once graceful and human. Elsewhere, Nick Derington pays homage to Mister Miracle with nice metallic and light shading, Elsa Charretier continues to prove her strong art-deco chops and Jeff Lemire unleashes his inner Dave McKean, with Black Hammer tipping its hat to Sandman trans-media, sketchy foundation.